Yorba Linda has 2 National Merit Finalist, Shawyun Foroushani and Melody Tang. Out of 1.6 million students who took the 2016 Preliminary SAT, only 15,000 were selected as finalists. The National Merit Scholarship Program determines approximately 7,500 Finalist who will receive scholarship offers. 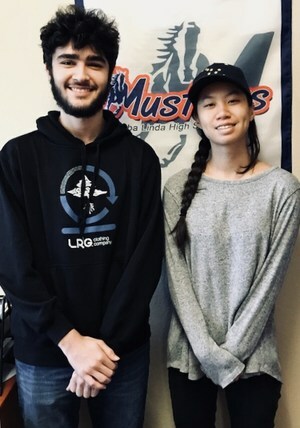 Congratulations YLHS Mustangs Shawn and Melody for your academic excellence! The National Merit Scholarship Corporation has announced that Yorba Linda High School has 2 National Merit Finalist. All Finalist will be considered for National Merit Scholarships to be offered in April-July 2018. Over 1.6 million students who took the 2016 Preliminary SAT/National Merit Scholarship Qualifying Test. The National Merit Scholarship Corporation identifies the 50,000 highest scores and 15,000 are identified as Finalists. From the Finalist, the NMSC determines approximately 7,500 Finalist who will receive scholarship offers. Congratulations YLHS Mustangs Shawn and Melody for your academic excellence!